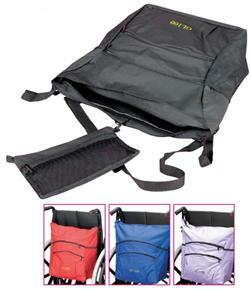 Wheelchair Carry Bag With A Removable Zip Pouch. This is an excellent quality bag, and is very spacious, good zipped pockets and pouch. Fully recommended. Very pleased with the quality of the bag and reasonably priced. I like these bags as they fit well on the back of my chair. They do however, wear out quite quickly and only last about 2 years. The zips are not very strong and break, so I\'m always careful not to over fill the bag. Great service from AMC and I will purchase from here again.